Primordial Undermind - "Universe I've Got"
Primordial Undermind is a Friends And Relations band featuring Doug Pearson who played violin with Das Ludicroix at Strange Daze. P.U. started out in the Boston area but eventually relocated to California, now firmly entrenched in the Bay Area. 'Universe' is their third release, the second on Camera Obscura. This one falls in the same vein as previous works, i.e. noisy psychedelic rock with dueling guitars and a touch of punk sentiment. Though this time, they haven't done much of the experimental droney pieces that were featured on 1997's "You and Me and the Continuum." Also, newcomers Bret Holley (bass), Grawer (drums), and especially Doug Pearson (violin/analog noises.) have modified the sound, though it's still guitarist/vocalist Eric Arn's band primarily. 'Universe' gets off to a whopping fine start with the eight-minute "Bandhu (gospel according to)," a masterful mid-paced slurry of fuzz, reverb, and heavy bass, countered by the obligatory synth swashes and effects. A much faster rumbling bassline then kicks off "Hypomorphic Array," and already I'm sold. Arn sings in a semi-mocking tone here, and while his voice isn't outstanding, it really suits the 'dirty' sound that P.U. has. The best use of the violin (though it sounds more like a reed instrument here) is found on "Jean to Sloan," a laid-back eastern piece that works well between the more aggressive tunes. "Manta" recalls SunDial of the late 80's with a dose of extra fuzz and lots of cool synth swirls and nice jangly guitar bits... it runs a bit long though. A highly subdued version of BOC's "Flaming Telepaths" starts off in excellent fashion (with acoustic guitar and violin plucking) and Arn does a commendable job with the vocals, but in the end I'm not totally sold on this attempt. To wrap up, both "Weightless Nemesis" and the swirling, whirling "Dervish" offer copious servings of the rambling, intertwining guitars of Arn and Brian Craft along with more eerie sounds from the violin poking out from behind the sonic curtain. 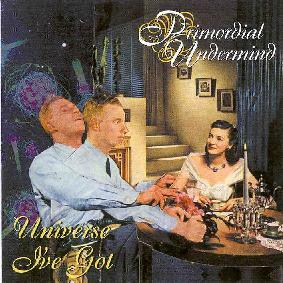 Anyone who digs Bevis Frond, SunDial, and the like should immediately take to Primordial Undermind's slightly off-color psychy sound. But I don't feel the album as a whole quite lives up to the promise of the first two outstanding tracks. So I'd still recommend the first release, "Yet More Wonders of the Invisible World" on September Gurls (GR) as the place to start, if you can still find it. Though once you've gotten a taste that way, you'll want this one too!